This looks so beautiful - and sooooo good. Would it be wonderful with rum raisin ice cream, or would that be over the top? What about the rum? There are so many different types of rum out there. I usually drink Gosling's Black Seal. Does that seem too dark to you because it sounds perfect to me? One day I heard someone in the store say they only ever drink Mount Gay Rum. Are you familiar with that rum? Since you don't specify "dark" brown sugar in the cake part of the recipe, does that mean it's light brown sugar? I love the way you used the word nestle in this post. Simply perfect. I'm waiting for your book to come out. Hello Victoria! I love all your questions. By all means, ask away! The rum raisin ice cream (which I love) as a side might be interesting but I'm worried you wouldn't taste the magic of the olive oil. Dairy has a way of masking other subtle flavors. Let me know if you try it! I'm not an expert on rum by any means. I worked mostly with Myers in the past. I didn't have any on hand when I wanted to test this cake, so I ran to the store down the block and they only had a little bottle of Bacardi Gold so I used that. I'm curious to try your suggestions. I used dark brown sugar. I'll fix the recipe. First of all I love your blog ! And I must make this cake,it looks and sounds crazy delicious..another to add to my TO BE BAKED list . I just wanted to say I've been quietly enjoying your wonderful blog for a while. Your photos and recipes are so enticing. Thanks! Chocolate Rum Raisin Cake sound delicious! I will print out your recipe and try it!! I made a chocolate cake with raspberry jam in the middle and topped with a thin layer of marzipan and then ganache layer topped with green tinted marzipan for "leaves" and raspberry candies for the "flowers". I love reading your blog, and the photos and recipes look fantastic. My experience making olive oil cakes has been hit or miss, but this is one I will definitely add to my "to be tried" list. what is the best substitue for rum? Thanks to all for your lovely support of my blog. I appreciate your comments. Umi, you can substitute brandy or if you're looking for something non-alcoholic, you can try coffee, although I haven't tested that substitution. it truly is a gorgeous dessert! 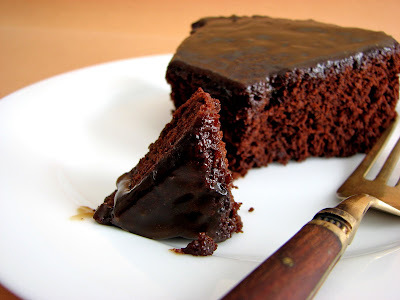 Chocolate cakes are my favorite! I'm really going to try this one. Thank you for sharing. Chocolate has always been my weakness. This just looks majestic. Hi Anonymous and thanks for your compliments on my blog! I'm glad to hear you got the nerve to try a recipe because I do try to make the instructions clear and the methods fairly simple. I'm wonder if you used an 8" cake pan? Even using a cake pan that is 9" can make a big difference in the end product. Also, the recipe calls for baking SODA rather than baking POWDER, so I'm not sure if you meant to say baking soda. Baking soda is about 4 times as strong as baking powder and is used with recipes that contain an acidic ingredient, like cocoa, sour cream, buttermilk, yogurt, brown sugar, etc. 1. Oven temp too low, which can happen if your oven isn't calibrated properly. Each oven has its own issues and hot spots, so it's good to buy a little temperature gauge to see if it's holding the right temperature. 2. Over-beating or under-beating the batter. Butter, oil, sugar and eggs (1 at a time) need to be aerated and emulsified, so be sure you are mixing well during each of those stages. Once you add any other liquids and flour, then you need to be careful not to overmix. Once your batter is mixed, put it in the oven immediately to capture the full effect of baking soda or baking powder. 3. Baking soda or baking powder that has expired. Check your container for an expiration date or test a spoon in a glass of water to see if it activates. 4. Adding extra ingredients not in the recipe. Depending on the nature of the composition and weight of extra ingredients, the chemistry may change or the baking time may change. Because cocoa has such a strong flavor, if you want to taste the impact of the oil, it is important to use one with a big flavor that will stand up to the chocolate. I hope this helps. I love this cake and I hope you were able to enjoy it, too! We made this for our frat party. Phi Chi Theta loved it! Thank you so much for this wonderful recipe. I baked it (slightly changed) for my husband's birthday. It was delicious. I love this cake and I hope you were able to enjoy it, too! Hello Anonymous and thanks for your questions. Cake flour has a protein content of 6% - 8% while all purpose flour has a protein content of 10% - 12%. So cake flour has less gluten and produces a much more tender product with a more delicate crumb. Cake flour comes in a box rather than a bag and should be available at most groceries. If you cannot find cake flour, you can try substituting a well known formula, although I have never tried it myself so can't speak to it directly. It is to measure 3/4 cup of all purpose flour and whisk in 2 Tablespoons of cornstarch (sometimes called cornflour). However, since all purpose flours vary so much in protein content, this isn't a sure-fire way to get the same texture in the cake. If you try it, please let me know how it turns out. The 350 degrees oven setting in this recipe is Fahrenheit. The standard conversion for Celsius is 180 degrees. The 8" x 3" pan I use here is approximately converted to 20 cm x 7 cm. Hi, Swati. Thanks for your questions. Did you plump the raisins in the rum before adding to the batter? When you doubled the recipe, what type and size of pan did you use? This has a great deal to do with baking time but 80 minutes sounds excessive. Thanks for sharing this wonderful recipe and thanks for your beautiful blog. Hello, eliabel! That looks delicious. I'm so happy you enjoyed it! Thank you for this amazing recipe!!! 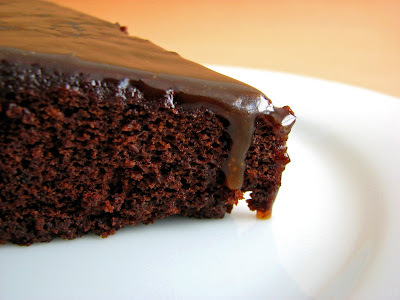 It is definitely the best cake I have made in a long time--the flavor combination, with the rum sauce, left me utterly speechless. I will definitely be making it for Christmas for my family. Well done! sarahm, I'm very grateful for your super kind feedback on this delicious cake! So glad you enjoyed it as much as I did. Hope you have a wonderful holiday season. Cheers! Just discovered your blog and made this cake today. It is out of this world! Thank you so much for this inspired combination of flavors and textures. Hello TheBeautifulBeach and thank you for reminding of this cake, which is especially delicious during this season. Love that you enjoyed it as much I as do. It's a bit irresistible. Hi! 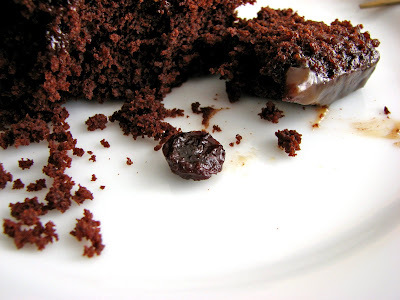 Loved your recipe for Chocolate Rum Raisin cake. Easy to understand and follow for not so good baker like me :). I wanted to know if i can use 9inch * 2inch baking pan and will changing the pan size bring any change in backing process. I am sorry for taking space for another question :(, In cake recipe i needed little bit more description for following items. - Vanilla - is it vanilla extract or or there is any other form of it. - any specific type of salt or daily use iodized salt can be used. Thank you so much for your help and guidance. Happy Holidays! Hello anu and thanks for your questions. You can use a 9" cake pan but it will bake faster and turn out thinner. Start checking it at around 28 minutes. Salt is every day table salt. 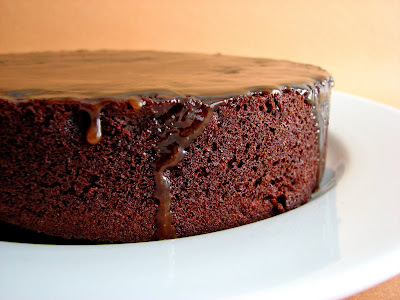 You can increase the sugar a tablespoon or two but any more and it will change the texture of the cake, make it perhaps too tender. And don't forget the glaze will add some sweetness as well. Hope you have a chance to enjoy the cake. Happy holiday to you and your family!